I had a request recently to create a wedding card. 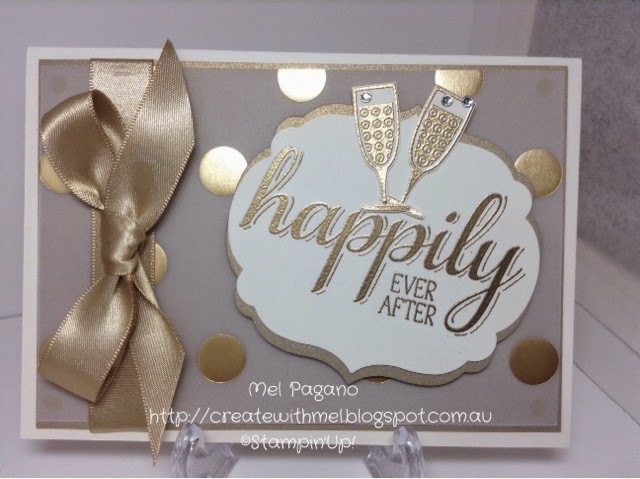 I really love the ‘Happily Ever After’ stamp from the Big News stamp set – so my challenge was to use it for this wedding card. I am really pleased with how it turned out and I am LOVING all that GOLD! Our gold embossing powder is so fine and is a gorgeous gold! Have you thought about becoming a demo? Would you just like a discount on products you are already purchasing foryour hobby? Well I am so excited to announce that Stampin’ Up! have a ONE WEEK ONLY opportunity to become a demonstrator with additional bonuses, other than what you already get! * 25% discount on your starter kit! That’s $235 worth of product for just under $127! Usually $169. Plus you still get your business pack! * an extra 5% discount (paid to you in January) on all orders placed during the month of Decemeber – that includes the 30% discount on your first order over $300 (placed in the first 45 days of joining). * As well as earning an extra 5% on orders in December, orders qualify for earning free product in January. * Only $440 of sales each quarter to continue as a demonstrator, with your first quarter ending last day in March. * Sneak peak at new catalogues and pre order products one month before catalogue releases. You would be joining an amazing team of wonderfully supportive demonstrators! As well as access to our Facebook Group, for ideas, inspiration, support and questions! 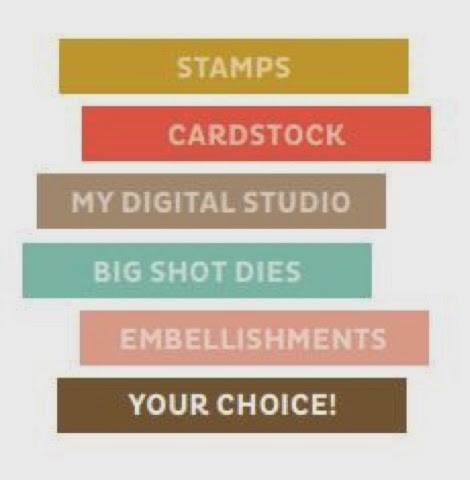 As a demonstrator you also gain exclusive access to tips and advice on exclusive Stampin’ Up! Websites. 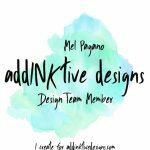 I would LOVE to have you join my team and build our creativity together! Contact me if you would like to discuss this opportunity further! REMEMBER – you can Join Up anytime, but this offer is available for ONE WEEK ONLY! 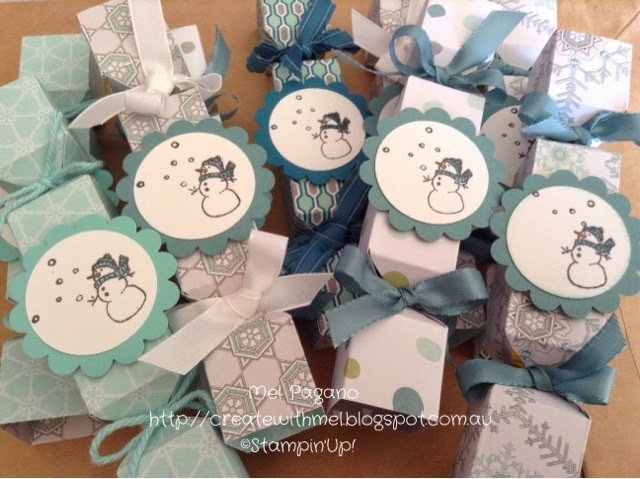 I had just a bit of fun today making these cute Christmas Crackers! Just big enough to fit a ‘little something’ in them. Most of these are last years Christmas Stack Paper, but they are made with the current Envelope Punch Board. You will find plenty of tutorials for these on you tube and pinterest if you are interested in creating some 🙂 …. Christmas is close!! Thought I would quickly drop by and show you how I had a bit of fun tonight whipping up this gorgeous card with my new Rich Razzleberry Blendabilities on the Blended Bloom Stamp. I’m really pleased with how it turned out. 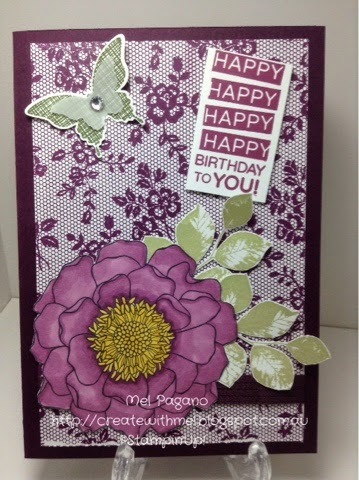 The background is the lovely blackberry bliss Cardstock and I Love Lace stamp! I love the look of the Lace and highly recommend stamping it in Baked Brown Sugar for a wonderful heritage appearance. It’s off to its new home tomorrow – What do you think?